Floyd Mayweather during his boxing career was known to be one of the best defensive boxers of all time and certainly the best boxer pound for pound of his particular era. His professional career spanned around twenty one years and over the course of it there was an interesting change in his fight style from how it started out to how it finished. Known as the ‘Pretty Boy’ early on in his career, he was much more explosive and recorded many highlight reel knockouts with blazing combinations and hand speed. As his career progressed however, the knockouts were less frequent as he moved up in weight and injured his hands which as a consequence made him pot shot more towards the end of his career where he was known as ‘Money Mayweather’. 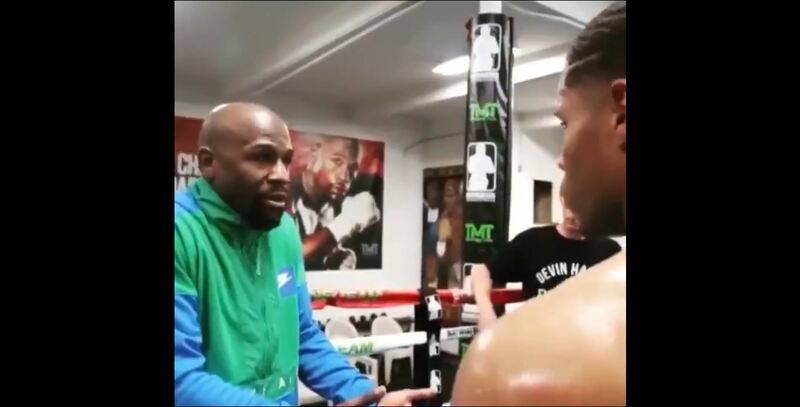 An interesting watch and insight for sure, perhaps Floyd Mayweather the boxing coach could have potential in the future. Mayweather as things stand is officially retired but suggestions that he might fight once more against Manny Pacquiao have not been totally ruled out just yet. 20 year old Haney is currently an undefeated lightweight with a professional boxing record of 21-0-13KO.